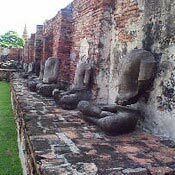 Wat Mahathat was built in the early days of Ayutthaya in the late 14th century by King Borommaracha I. 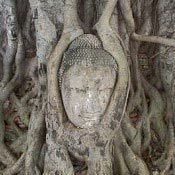 The story goes that the king had a revelation, and relics of the Buddha then suddenly appeared. The temple was built to house the relics. 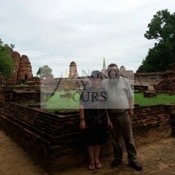 Wat Mahathat Ayutthaya was built in the early period in 1374. 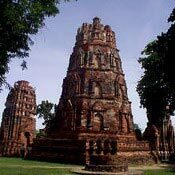 The main stupa is Pang shape made of laterite but in the later periods was resored with brick. 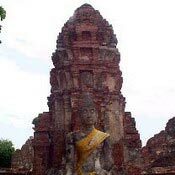 The construction of Wat Mahathat was begun during the reign of King Borommarachathirat I in 1374 A.D. but was completed during the reign of King Ramesuan (1388-1395 A.D.) When King Songtham (1610-1628 A.D.) was in power the main prang (Khmerstyle tower) collapsed. 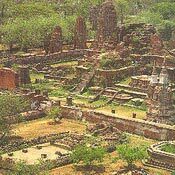 The restoration work on the prang was probably completed in the reign of King Prasatthong (1630-1655 A.D.) During the restoration the height of the prang was considerably increased. Wat Mahathat was restored once again during the reign of King Borommakot (1732-1758 A.D.) when four porticos of the main prang were added. 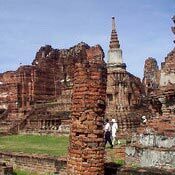 In 1767 A.D. when Ayutthaya was sacked the wat was burnt and has since then been in ruins. 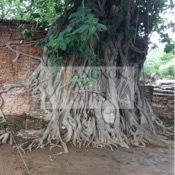 It is most famous for the Buddha head trapped in the Bodhi Tree.